This contemporary, hilltop B&B offers views over the olive trees of the Côtes du Rhône wine area. 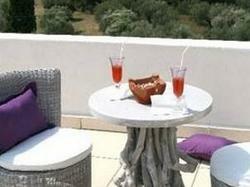 Set in a garden with a pool, pool house and terrace, it offers rooms, studios and caravans with free Wi-Fi. All accommodation at Dar Mona is air conditioned and has an en suite bathroom. Each has a private entrance, garden views and a flat-screen TV with satellite channels. A continental breakfast is provided every morning and can be delivered to the room to be enjoyed on the private terraces. You can prepare other meals in the shared kitchen, which includes an indoor barbecue. Located 3.5 km from the A7 motorway and Piolenc, Dar Mona is 15 minutes' drive from Orange and its train station. River Rhone and the Gorges de l'Ardèche are a 9-minute drive away and Châteauneuf du Pape is a 30-minute drive. Decorated in soft colours, this suite features a garden, a view of the olive trees, a reading corner, TV and music system. There is also BBQ facilities and a private bathroom. Decorated in a romantic style, this air-conditioned suite features a four-poster bed, a furnished terrace with views of the olive trees, a living area, a library, TV and a private bathroom. There is also BBQ facilities. This villa features a large living area with a flat-screen TV and fireplace. It includes an equipped kitchenette, outdoor dining area, BBQ facilities and a mezzanine level. Bread and pastries can be delivered each morning. Decorated in a vintage style, this air-conditioned, spacious studio is located next to the pool and has a private bathroom with tadelakt walls, a seating area with a flat-screen TV and free Wi-Fi. It also has an equipped kitchen under the pool house with BBQ facilities. Bathrobes and free toiletries are provided. This air-conditioned room features a private terrace with views of the olive groves, flat-screen TV, free Wi-Fi access and tea and coffee making facilities. The en suite bathroom includes a walk-in shower and bathrobe. This air-conditioned wooden caravan is decorated in a colourful vintage style and includes a private bathroom, kitchenette, dining area, and 1 single bed and 1 double bed. There is a hammock just outside the caravan and a breakfast basket with bread and pastries can be delivered each morning.